On occasion, the Blog departs from its usual mission of bringing you the latest and greatest in human genetics news in order to report on particularly interesting discoveries in other species. Many times these stories are about dogs and the reason is simple: dogs are awesome. Well, there is more to it. In addition to being faithful companions, dogs make great subjects for genetics research–the time between generations is much shorter in dogs than humans, they have multiple offspring per pregnancy and unlike in humans, it’s not unethical for scientists to decide which males and females breed together. A luminary in the field of dog genetics is Elaine Ostrander, chief of the Cancer Genetics Branch of the National Human Genome Research Institute. Her lab uses dogs to study cancer susceptibility genes, but along the way they’ve made some fascinating discoveries about the incredible variation seen between the many breeds that make up the single species Canis lupus familiaris. In 2007 Ostrander’s group showed that small size in dogs–think Chihuahuas and Pomeranians–can be traced to a single variant of the canine IGF-1 gene. 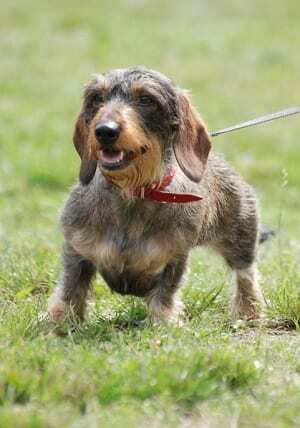 Now, in a paper published online this week in Science Express, they have shown that a single evolutionary event is behind the short, curved legs characteristic of all those adorable dachshunds, corgis and basset hounds. Ostrander’s group found that dogs having stubby little legs, technically termed chondrodysplasia, harbor an extra copy of a growth factor gene called FGF4. But this is no ordinary gene duplication that happened as the result of a DNA replication error. Instead, the researchers found that the extra copy of FGF4 is a retrogene, a piece of DNA copied from and then inserted back into the dog genome by a virus. Retrogenes are nothing new. They’re known to be a major source of genetic change that takes place as different species split apart from each other. But this new study is the first to show that a retrogene can cause long-lasting variation within a species. The various stumpy-legged dog breeds were developed in different places around the world, at different times and for various reasons. So there’s no evidence that they share a recent common ancestor. But the FGF4 retrogene appears to be identical in all of them, suggesting to the researchers that it arose only once, probably before early dogs split into modern breeds. These new findings don’t just represent an advance in the understanding of dog genetics, or even the fundamentals of DNA and evolution. They also have implications for human health. The type of growth disorder seen in the dogs with the retrogene is reminiscent of hypochondroplasia, a type of dwarfism. Scientists know that a mutation in one gene is responsible for most cases of this condition, but the cause of the rest remains a mystery.